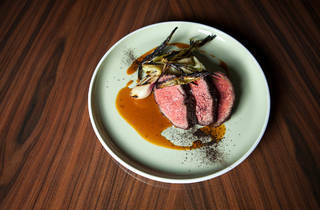 Paley may be named after a Hollywood titan, but its menu is a paleo fanatic’s dream. This used to be a corner of Hollywood where magic was made. 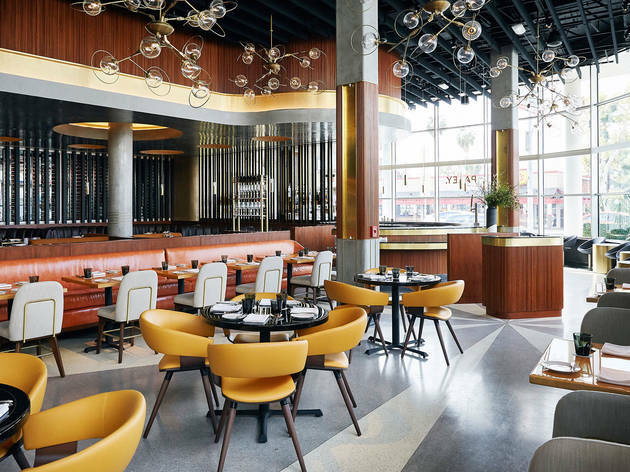 Known as Columbia Square, the block that now houses a Sugarfish, Sweetgreen and a chic co-working space called NeueHouse was a central meeting spot in the 1930s and onward, a place where industry buffs came to schmooze and dine. 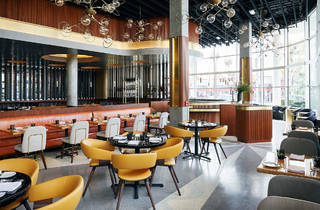 Named after CBS CEO William S. Paley, the restaurant is a visual ode to the era, so grandiose in design that, at first glance, it might induce some eye rolling. But soon you will realize that yes, Paley’s mid-centruy aesthetic is indeed beautiful, and no, it is not all for show. 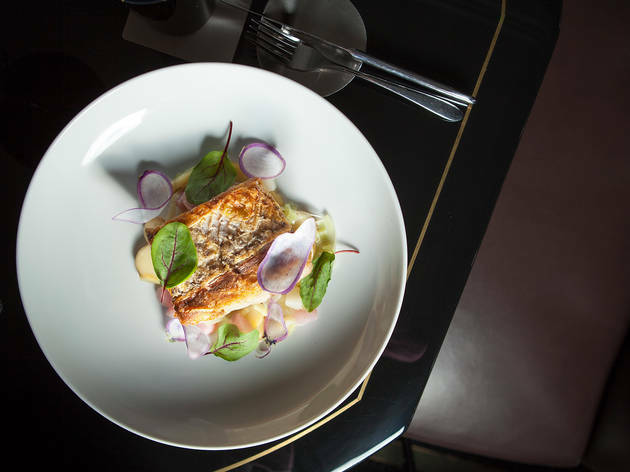 Chef Greg Bernhardt is cooking some seriously excellent food here—glamorous enough for old Hollywood, grounded enough for new. 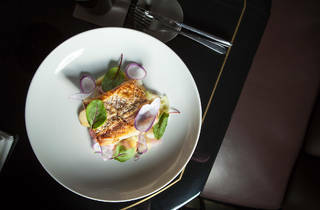 Though Paley might scream “steak and martini” when you walk in, its raw bar—and seafood in general—is the shining star. 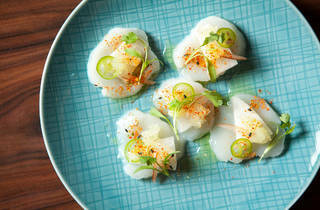 On one visit, I had a scallop ceviche so good that I thought the dish couldn’t get any better. On another visit, we were told the scallops had changed, and I prepared for disappointment. 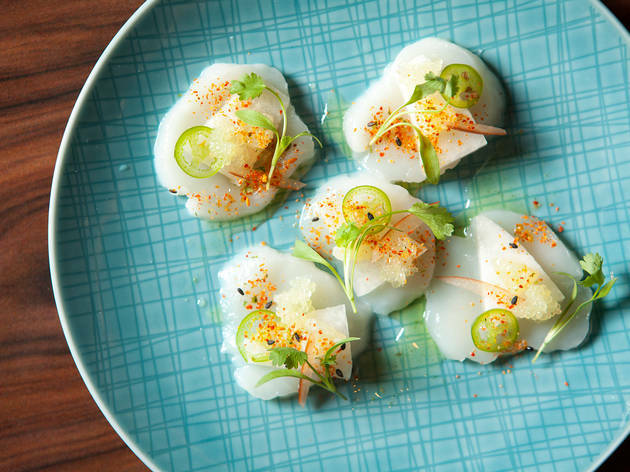 But they were a step above the second time around: the bright mollusks were now sliced thinly like carpaccio, drizzled in finger limes and topped with slices of sweet toy box melon and jalapeño. 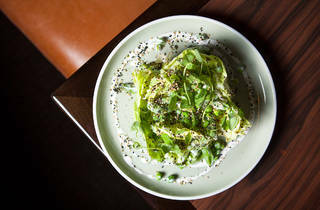 Interspersed with bites of the butter lettuce and English peas—a massive mound of greens tossed with crème fraiche and the Japanese condiment nori goma furikake—you could vow to subsist on protein and vegetables forever. 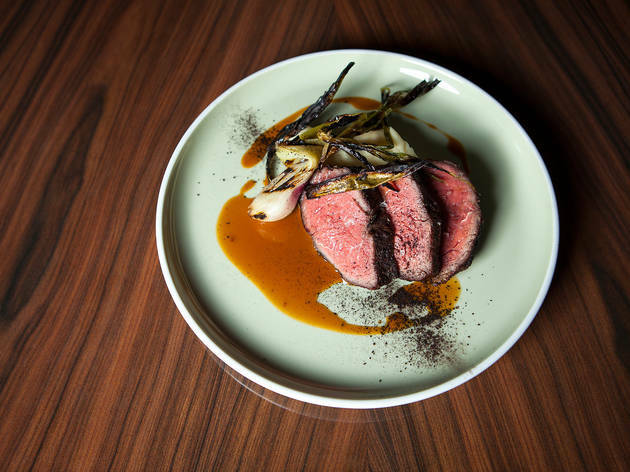 Paley may be named after a Hollywood titan, but its menu is a paleo fanatic’s dream. Still, there’s always a pasta dish on the menu, and I was lucky enough to try the Okinawa potato raviolo before it was swapped out a week later for a spaghetti plate. Similar to ube, the Okinawa potato is a sweet, purple variation of the vegetable; here it’s encased in a single, exemplary raviolo sitting in mushroom broth, surrounded by various fungi and herbs that lend a rich earthy quality. It’s a far better pick than the Manhattan steak, which came out on the brink of being well-done despite us asking for medium-rare, though a side of potato purée was silky smooth. (Paley! Killing it with the potatoes.) Pasta, meat, fish—whatever you choose, make room for dessert. 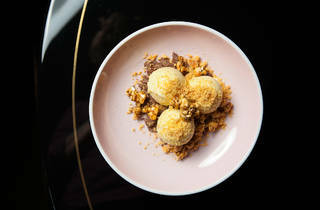 “The popcorn ice cream is bananas,” said our waiter, and he was right in the sense that it’s a fun bowl of popcorn-infused scoops, a sprinkling of brown butter powder and salted chocolate rocher rounding out the dish. It’ll make you feel like going to the movies—as if this part of Hollywood didn’t do that enough already. What to Eat: The scallops ($15). 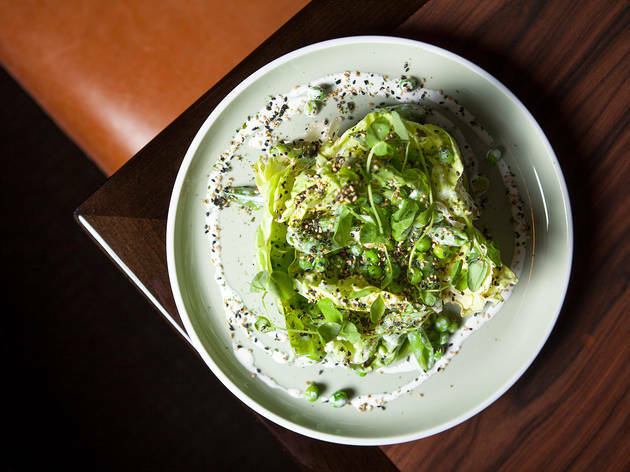 The butter lettuce and English peas ($12). The Okinawa potato ravioli ($22). The popcorn ice cream ($9). 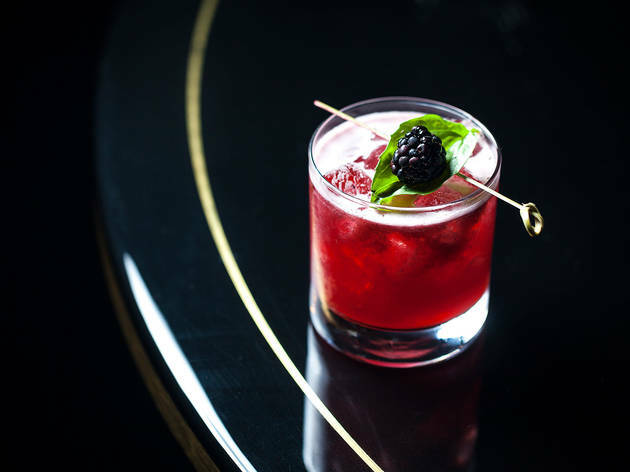 What to Drink: Paley is as much of a place where you can meet for cocktails as it is for a full meal. The bar is classy as hell, a beautiful, narrow section with comfortable swivel chairs beneath a sleek countertop. On the cocktail menu, you’ll find ingredients like lavender and basil sprinkled throughout herbaceous drinks. 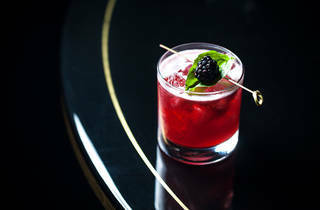 The Minor Situation ($14) is an excellent situation, made with house blended whiskey, house sour, blackberries and basil. It’s a little bit sour, a little bit sweet, but for something with a more savory note, go for the Smokin Smile. 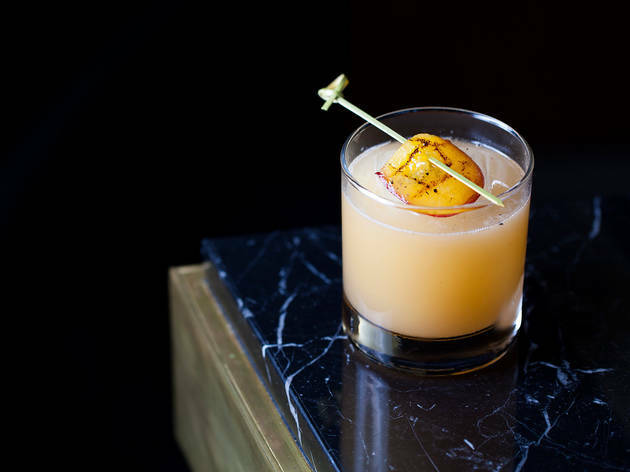 Mezcal, lemon, amaro nonino and peach purée are blended together for a thick, creamy libation, topped off with a roasted peach slice for good measure. 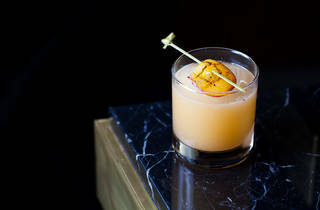 There’s wine and beer, too—but with cocktails this good, stick to the hard stuff. 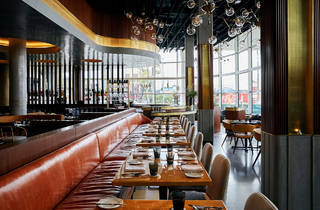 Where to Sit: Paley is a mid-century dream, so it’s best to sit where you can get a good look at the Jetsons-inspired lighting, the mustard-colored chairs, the raw bar and the luxurious booths. Don’t care about all that so much? The outdoor patio is fine for weekend brunching. I've only been to Paley for happy hour at the bar, but dinner looks delicious as well. For happy hour they have $5 red/wine/rose wine and beer options + half price of their seasonal specialty cocktails. There is a nice menu of small bites for sharing as well. 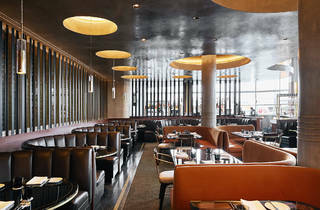 The bar area is comfortable and well lit, restrooms are clean and well-maintained. Parking validation is available at the hostess stand. 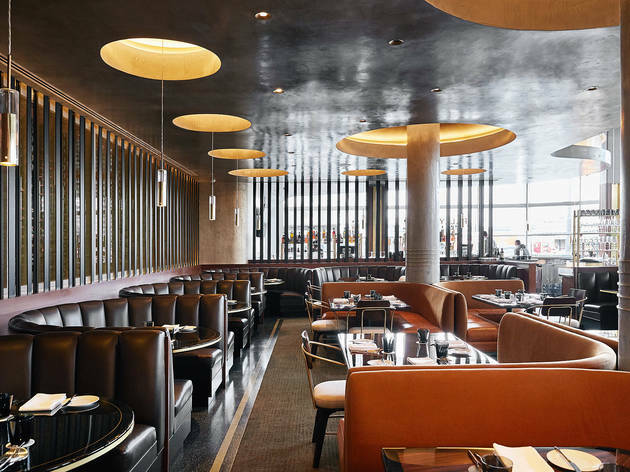 Paley is also a great spot to grab a drink while waiting for your table at Sugarfish with does not take reservations so you might be waiting for a little while and it's right next door. How pretty is Paley? 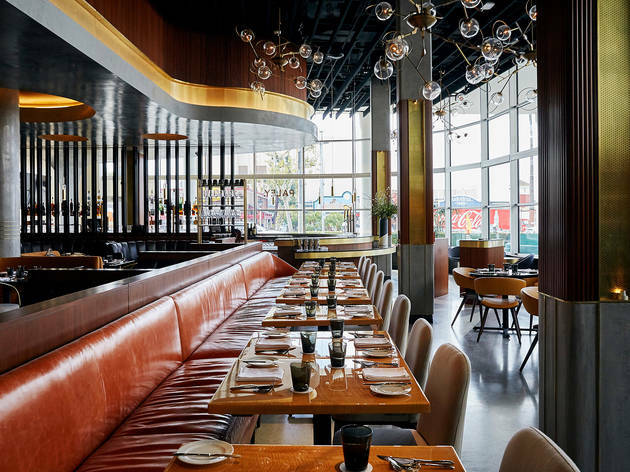 While it may skew toward the tastes of a bit of an older crowd, there's no denying that the decor is classic Hollywood glam. And the bathrooms might be the coolest in L.A., so it has that going for it as well.